Bull bar – I’ve gone with an ARB steel bull bar. A bull bar is a must have if you want to have any chance of driving away after hitting wildlife (unfortunately all too common here in Australia). Even though I won’t be getting a winch, the bar I’ve chosen will take one, in case I change my mind in the future! The bull bar will also have a rated recovery point fitted, as at the moment she only has tow points. This will be critical and I encourage any 4WD owner to check their manual to see if any eyelets under the car are rated for recovery or are just for towing. Roof rack – As we won’t be towing, we’ll need a roof rack to help carry some of our gear. I’ve chosen ARB again and gone with their lighter alloy version. It has a mesh floor and side barriers, so will be perfect for storage. Dual batteries – A car fridge is an essential item for us and I don’t want to run the risk of draining the main “crank” battery by running it. By (carefully!) moving a couple of things in the engine bay, a second “deep cycle” battery can be fit in. The 12v points (cigarette lighters) in the car will be wired to run off this battery and one of these will run the fridge (and any other gadgets!). Suspension – She still has the factory suspension fitted, which is now 12 years old. It won’t cope with the driving we’ll do and also being heavily laden with all of our gear! As there are so many options for springs and shock absorbers, I’ve gone with Artarmon Auto’s recommendation of Lovell springs and Bilstein shocks. She’ll also get a 50mm lift to help with clearance, especially when fully loaded! 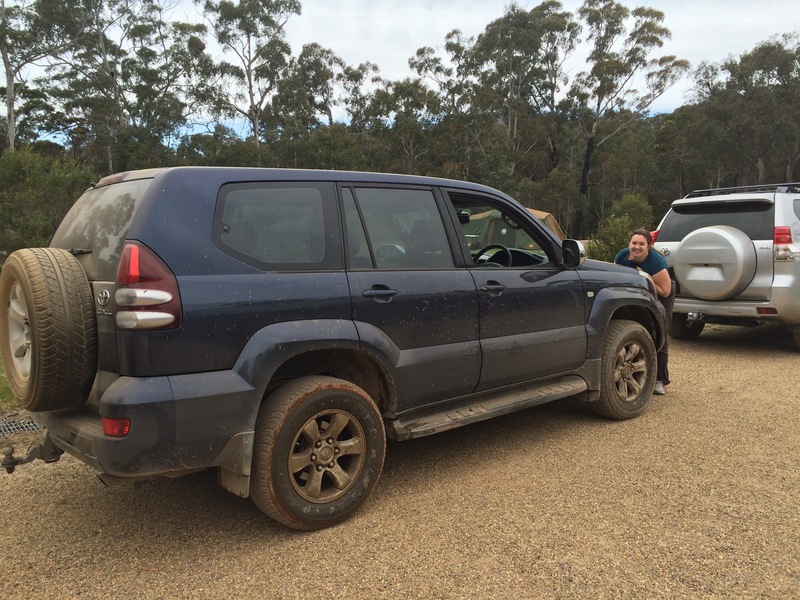 Tyres – We received some good advice and information on the 4WD training course about tyres. After this, and on Vic’s recommendation, I’m going with Cooper A/T3’s. These will be in a light truck construction, which means they’re tougher built than a passenger vehicle tyre. This should reduce our chances of getting a puncture and we’ll get good mileage from them. They’ll also be fitting a diff breather kit (just in case a river crossing is a little deeper than we were expecting!) and a UHF radio that we bought at the recent 4WD and Adventure show, so the bull bar will have an aerial on it! So after all this, what’s left to do? Well, I’m considering whether to get spotlights fitted and also a cargo barrier, but more importantly we have to think about storage in the back of the car. How can we pack the car (and unpack, pack, unpack, pack…) easily without losing our minds in the process! We’re not convinced that a built in drawer system is the way to go, and it’s also quite expensive. So I’m contemplating having something simple built that will accommodate the tent and then using some simple options, like plastic drawer sets and storage containers. These can be tied down to the various points in the floor of the boot. Further research is required for this bit! If you have any suggestions then I’d love to hear them! I’ll post photos of Priscilla Mk II later in November!